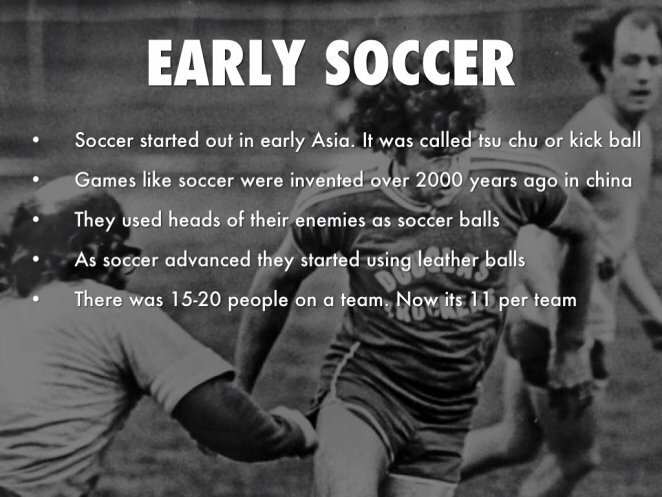 History of soccer dates back to Chinese Dynasty, when the game was played using pigs bladders or heads of enemies for a ball. Soccer history as a modern game seen today, starts with the official rules for soccer, made in 1863, at a Freemason's Tavern, located in London. Man named Cobb Morley, from England, is an important part of soccer history as he formed the first Semi-Professional soccer team in the history of this game. Team name was Barnes Club, established in 1862. Cobb Morley talked about this game needing rules, and more organization in order for it to prosper. To help get the word out, Cobb published an article in the local newspaper regarding the rules and organization of soccer in the upcoming years. Only 1 year after the article was published, founding members of different clubs joined Cobb Morley in creating the official rules for soccer. That was more than a century ago, making year 1863 an important year in the history of this great game. Cobb's idea for rules and organization in soccer helped establish the very first Soccer Governing Body in England, called Football Association or FA. Being the first Governing Body in Soccer, Football Association also wrote the Official Laws of the Game back in 1863. With the years passing, history shows more and more Countries forming their own Soccer Governing Bodies, based on England's Football Association. Soccer was slowly getting introduced to most Countries, and each Club and Country has a different soccer history of its own. Every league in the world based their soccer rules on the Original Laws of the Game, written in 1863 by the Original FA (Football Association). Laws of the Game have helped bring soccer to where it is today, becoming the most popular sport in the world with close to 150 years of soccer history, and counting. Back than players did not make much money for playing soccer, however over the years soccer has become a very lucrative business that rewards top players with wealth and fame. Millions of dollars are spent on bringing top players to different Clubs around the world, and soccer has become a Multi Billion dollar industry played and watched everywhere around the world. Recent soccer report shows that 3 billion people play this beautiful game around the world and that number is rapidly growing every day. Every Country has made their own mark on soccer history. Based on the historic event in 1863, England, history of modern day soccer starts in London, were the Laws of the Game or today's constitution of soccer was originally written. For more information on Soccer History visit FIFA Soccer History.